Hygiene is of great importance for us. We do not allow people coming and going in and out of our work space other than the person to be tattooed. All our equipment that is not single use (e.g. the tattoo machine, plastic bottles) are covered with single use plastic bags or wrap and cleaned thoroughly with alcohol before each new client. 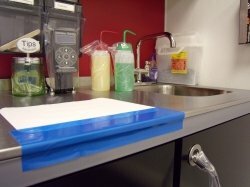 Beds, chairs, stools, armrests etc to be used for tattooing are also covered with single use plastic prior to tattooing. Pets and smoking is NOT allowed in our establishments. We always try to do our out-most to avoid cross contamination. MOST QUALITY INK COMPANIES WILL ONLY SELL TO REGISTERED TATTOO STUDIOS. BE CAREFUL WHAT YOU PUT IN YOUR SKIN. We are proud to present to you the Cheyenne Hawk Spirit. A rotary tattoo machine, Designed and Manufactured in Germany, with strict European Standards in mind, specially developed for the Professional Tattoo Artists. The HAWK means perfection and top-quality technology for perfect work. Much more HYGIENIC than the traditional tattoo machines thanks to it's robust and single pieced designed, which makes it easier to clean and safer for the clients. LOW NOISE which will let you relax and feel more comfortable during the tattooing process. Rotary motor which makes it more PRECISE (especially when working with fine detail pieces) and also allows the artist to work faster WITHOUT the risk of overworking and damaging the skin.